Wedding hairdos for medium hair come in a wide variety of styles and shapes. Medium length hair covers any length from the collarbone to the chin, and this variation means that you have an almost infinite number of options depending on how long or short you want your hair to be. You can do an up-do, have your hair down or do something in between; it’s all up to you! When looking for wedding hairdos for medium hair, spend some time on the internet looking at pictures. Save and print any that strike your fancy and discuss them with your hairstylist to see which will look best with both your dress and your face and body shape. Schedule one or two practice run-throughs with the person who will be handling your hair so that both of you are certain of the style you like and how to fix it so that there aren’t any surprises on your big day. 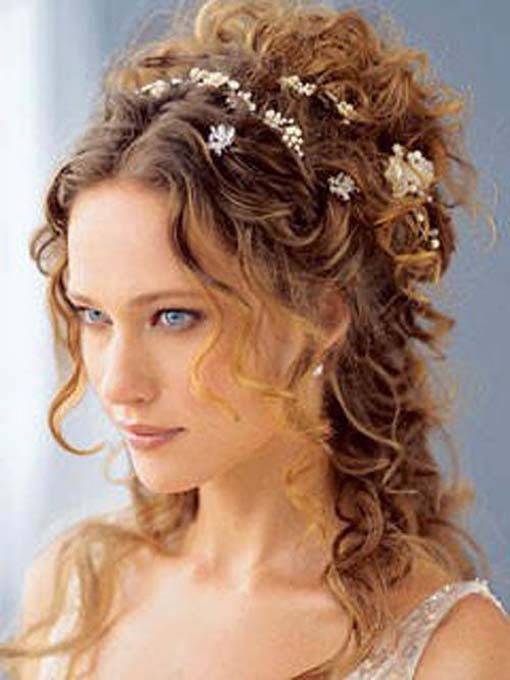 Choosing your accessories is also critical in picking the right wedding hairdos for medium hair. If you’re going for a tiara, consider wearing your hair either all up or all down so that the tiara is given a chance to stand out. Half up-do’s are best with clips or smaller accessories that can glimmer through the hair but act more as accents rather than stars of the show. Be sure to get your hair touched up color wise and trimmed about two weeks before your big day. Talk to your stylist about what colors are best and the time of year you’re planning to get married will affect this. You want your hair to look natural, so bright blonds are probably not going to be the best option for brunettes if you’re getting married in December!